Discover the best of China, from the ageless clay faces of the Terracotta Army to the iconic Tiananmen Square in Beijing and the pulsating cities of Shanghai and Hong Kong, this still-enigmatic land blends ancient history with imposing Maoist architecture and glittering, 21st century skyscrapers. Cruise through the wooded mountains of the mighty Yangtze River, the world’s third longest river, stretching nearly 4,000 miles through China’s heartlands, and winds through the breath taking Three Gorges. Experience the magical allure of China both old and new with Affordable World Tours. No reviews yet for this trip. Browse other reviews below for Affordable World. Depart from the US and head overseas for an adventure of a lifetime. Spend the night aboard as the jetliner glides across the International Date Line. Our local guide is there to greet us as we arrive in Beijing, the economic and political center of the nation. Transfer to the luxury accommodations provided for a good night’s rest. Spend the day free or take the tour to visit the Great Wall, which is one of the man-built architectures that can be seen from the low orbit of the earth. The Great Wall is a massive defensive structure built to keep intruders from invading the mainland. It stretches an impossible 4000 miles across China's north, covering nine provinces. 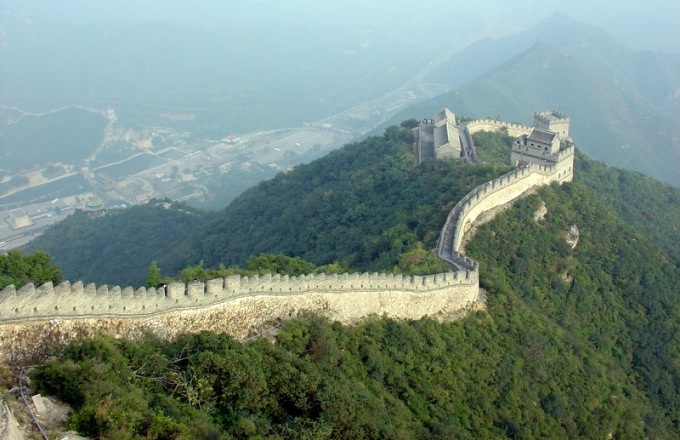 An enormous undertaking that originally began under Qin Shi Huang (first emperor of China) in 200 B.C., the Great Wall was not completed until the Ming Dynasty in 1640. This morning you have plenty of time to walk along its ancient path and experience part of China's fascinating history. Today, we start our Beijing Capital tour with Qianmen Street. Qianmen Street was a commercial and entertainment hub due to its convenient location, connecting the Imperial Palace with other communities in Beijing. In the run-up to the 2008 Olympics, the street underwent a rejuvenation to restore the streetscape to that of the early 20th. A visit to Tiananmen Square, the world-famous and historic Tiananmen Square, or “Gate of Heavenly Peace”. Located in the heart of Beijing, Tiananmen Square was once the main gate to the Imperial Palace during the Ming (1368-1644) and Qing (1644-1911) dynasties. Today, it is home to the Monument to the People’s Heroes, Mao Zedong Memorial Hall, National Museum of China, and the Great Hall of the People. Afterwards, we drive by the famed Olympic Site and have a photo stop at Olympic National Stadium (the Bird's Nest), Olympic National Aquatics Center (the Water Cube) and National Center for the Performing Art. In the afternoon, you have the opportunity to explore the home to Ming and Qing emperors, Forbidden City. Comprised of 800 buildings covering 720,000 sq. meters, it is the world's largest palace complex. Board a short flight to Yichang,the cultural and economic center of the western Hubei Province. Upon arrival , we board our ship sets for our Yangtze River adventure. Arrive at Sandouping, you can stay on board and rest or take the optional shore excursion to explore the Three Gorges Dam Site, located in the middle of the Xiling Gorge. This massive water conservancy project is the largest of its kind in the world and will forever change the landscape of the Yangtze River valley. In addition to controlling flooding, navigation and irrigation, the dam does have a lofty green initiative – creating a major source of hydroelectric power for China. Reboard and sail through Xiling Gorge, the longest and deepest of the three. Arrive at Wushan, you have the option to stay on board or disembark to board smaller vessels to reach the Lesser Three Gorges via one the Yangtze’s tributaries. After coming back from the Lesser Three Gorges, you will reboard the cruise ship and sail through the elegant Wu Gorge, renowned for its vertical cliffs and 12 mist-shrouded mountains. Enter the final gorge, Qutang Gorge, the shortest but most impressive of the three. Today, you can choose to stay on board or go on the shore excursion to visit one of the three towns (depending on local river conditions): Shibaozhai, Fengdu, or Wanzhou.Shibaozhai's main attraction is a majestic 12-story tall wooden pagoda, built 400 years ago without use of a single nail. Fengdu is a peculiar site nicknamed “ghost city”, because it contains mystical statues of devils and ghosts that roam the afterworld. Wanzhou is a small mountainous city which is considered an important port and industrial hub. Our Yangtze River journey comes to an end as we dock in Chongqing, a scenic cliff-side city that overlooks the conflunece of the Yangtze and Jialing Rivers. Transfer to Xian, the capital of Shannxi Province, one of the oldest cities in China. Xian is one of the Four Great Ancient Capitals of China with more than 3100 years of history. The city was known as "Chang'an" before Ming Dynasty. Xian is the eastern teminus of the Silk Road and home to the Terra Cotta Warriors. Upon arrival in Xian, we will drive into town, passing through its massive City Wall, the best preserved defensive wall structure on earth and have a picture stop at Drum Tower and Bell Tower. In the evening, don't miss the chance to taste the local famous dumpling banquet. Spend the day free or take the tour to witness the famous "Terra Cotta Warriors." The serendipitous discovery of the Terra Cotta Warriors in 1974 has drawn throngs of visitors to Xian each year, and ranks as one of the world's most important recent archaeological finds. Three excavation pits have been opened to the public with a fourth underway. Spend some time admiring the fine troops, horses, and carriages in battle formation. After lunch, the motorcoach takes us back inside city limits to visit the Big Wild Goose Pagoda, a well-preserved ancient building and a holy place for Buddhists. It is rated as a National Key Cultural Relic Preserve as well as an AAAA Tourist Attraction. Tonight, take the opportunity to enjoy the cultural musings of the Tang Dynasty Show, a song and dance performance which reflects the rich cultural history and prosperity of the Tang Dynasty (618-907). Board a flight to Shanghai, the largest metropolitan center of China.She is a bright pearl at the mouth of the Yangtze River and China's largest economic center. This morning, we visit the Shanghai Museum and view the exhibits of ancient Chinese art. Designed by a local Shanghai Architect, the current building was completed in 1993 and resembles the shape of a bronze cooking vessel. Afterwards, we visit City God's Temple, the Nanjing Road and the Bund. Spend the afternoon to relax at the hotel or take the optional tour to Lujiazui Finance and Trade Development Zone and a ride on Huang Pu River Cruise. In the evening, do not miss the opportunity to experience the exciting Chinese Acrobatics Show (with dinner). Written notice of cancellation must be received by Affordable Asia either by mail, or email. Oral cancellation by phone will not be acceptable.